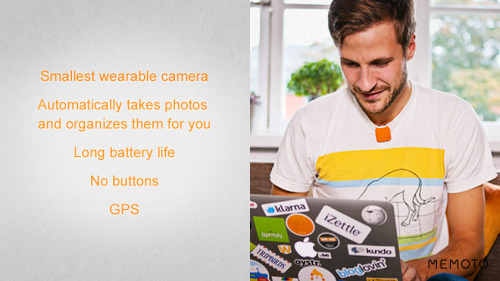 "The Memoto camera is a tiny camera and GPS that you clip on and wear. It’s an entirely new kind of digital camera with no controls. Instead, it automatically takes photos as you go. The Memoto app then seamlessly and effortlessly organizes them for you." Why do I blog this? Referencing another small-camera-which-may-be-useful-for-field-study object. "*They’re not dead yet, but they serve no technical function, other than the skeuomorphic legal and..."